Mission specialist Steve Robinson approaches the underside of Discovery. HOUSTON - For the first time in the historyof NASA's shuttle program, an astronaut has repaired the spacecraft's heatshield in space during a spacewalk staged from the Discovery orbiter Wednesdaymorning. Discovery'sSTS-114 astronaut Stephen Robinson used his own "A Number 1" fingers to pulltwo strips of ceramic fiber cloth jutting out from between the heat-resistanttiles lining the shuttle's belly. The repairbrings mission managers one step closer to clearing the orbiter's heat shieldfor landing. "It lookslike this big spaceship is cured," Robinson said as he plucked the final strip,known as a gap-filler, from the starboard side of Discovery's forward section. Robinson isthe first astronaut ever to get close to the vehicle's black ceramictiles--which protect space shuttles from the searing heat of reentry--in space. Mission managers sent him under Discovery's belly becauseof concernsthat the gap-fillers could disrupt the aerodynamics experienced by the orbiterduring reentry and cause increased heating downstream on the tile surface andwing leading edges. The space-filling material is used to prevent tiles fromgrinding against one another during launch and to fill in excess space betweenheat-resistant ceramics. "Thanks tothe whole team for making this day super smooth and easy, as well historic," Robinsontold flight controllers and the spacewalk planning team. Thespacewalk began at 4:48 a.m. EDT as the Discovery-International Space Station(ISS) stack passed more than 200 miles over the southeast coast of Australia, marking the 61stextravehicular activity (EVA) to support the ISS and the 28th to doso from a U.S.space shuttle. Adamaged thermalblanket, puffing out just below one of the flight deck windows at Discovery'snose, is all that stands in the way of a clean bill of health for the shuttle'sheat shield. While not a thermal concern--shuttle officials said the blanketcould be removed entirely and pose no danger to the orbiter or its astronautcrew--engineers are studying whether the small piece of fabric could separatefrom Discovery during reentry and damage the spacecraft. While notthe first on today's space work docket, the orbital repair was a highlight ofthe EVA. By about 8:00 a.m. EDT (1200 GMT), Robinson had strapped into thespace station's robotic arm - controlled by STS-114 astronauts Wendy Lawrenceand James Kelly - and was on the move toward Discovery's heat shield. 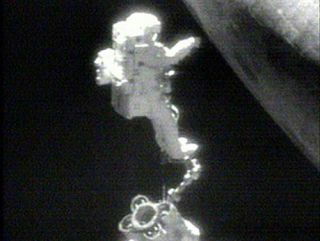 Noguchiwatched from a vantage point on the ISS, while cameras aboard the station'sarm, Discovery's own robot arm-mounted orbital inspection boom and Robinson'shelmet recorded the repair. "I'mpulling now," Robinson said, as he removed the first gap-filler. "It's comingout very easily." The second gap-fillerfollowed just as easily about 10 minutes later. "That cameout very easy, probably with even less force [than the first]," Robinson saidof the second gap-filler. The repairwas completed at 8:55 a.m. EDT (1255 GMT) as Discovery and the ISS flew morethan 200 miles (321 kilometers) above the coast of France. "You guysare going to be really glad I brought a camera," Robinson said as he snappedphotographs of Discovery after the repair. "Nothing could look weird to meafter this." "It's trulyspectacular, no other words," Robinson said. Discovery'sSTS-114 mission is the first shuttle flight since the 2003 Columbia disaster. Columbia'sseven STS-107 astronauts were killed when the orbiter broke apart over Texas while reenteringthe Earth's atmosphere on Feb. 1, 2003. Investigators later found that damageto Columbia'sheat shield--a puncture in its left wing leading edge from foam debris shed atlaunch - allowed hot gases to enter and rip apart the vehicle. NASA spenttwo and half years and $1.4 billion to enhance shuttle flight safety and buildnew in-flight inspection tools and procedures to evaluate shuttle thermalprotection systems while orbit. An unacceptable chunk of foam did fall fromDiscovery's external tank at launch but did not strike the orbiter, promptingofficials to groundits shuttle flight until the matter is understood and solved. But the STS-114flight has successfully demonstrated the use a new sensor-tipped inspection boomand an orbiter backflip maneuver to allowstation-bound astronauts to photographshuttle tiles, both of which contributed to today's EVA. "Everythingthe team said would happen did," Robinson told flight controllers. Late in thespacewalk, flight controllers directed STS-114 mission specialist Charles Camarda and pilot James Kelly to use the boom to inspectthe damaged thermal blanket. In additionto repairing Discovery's heat shield, the STS-114 spacewalkers also installed anew spare parts platform outside the space station's Quest airlock, as well asa materials exposure experiment that sent Noguchi scaling up to the highestpoint atop the ISS. Noguchiinstalled the Materials International Space Station 5 (MISSE 5) at the top ofthe P6 truss, which rises about 60 feet (18 meters) above Discovery's payloadbay. After attaching the experiment, Noguchi took a series of photographs tocapture the vast panorama of the ISS, shuttle and Earth below him. Noguchi andRobinson were not able to retrieve a broken rotary motor from the ISS to returnto Earth, nor perform a camera group installation due to the heat shieldrepair, NASA officials said. Today'sspacewalk was the last EVA scheduled for the STS-114 crew and the third excursionfor both Noguchi and Robinson. With the end of the EVA, both astronauts haveamassed 19 hours and five minutes of spacesuit-clad work time. Robinson,Noguchi and the rest of the STS-114 crew will now focus on completing cargotransfer activities at the space station. A memorial to the lost Columbia astronauts isslated for Aug. 4 at 8:04 a.m. EDT (1204 GMT) and undocking scheduled for Aug.6 at 3:22 a.m. EDT (0722 GMT). Discoveryis scheduled to return its STS-114 crew to Earth on Aug. 8 during an earlymorning landing at Kennedy Space Centerin Cape Canaveral, Florida.